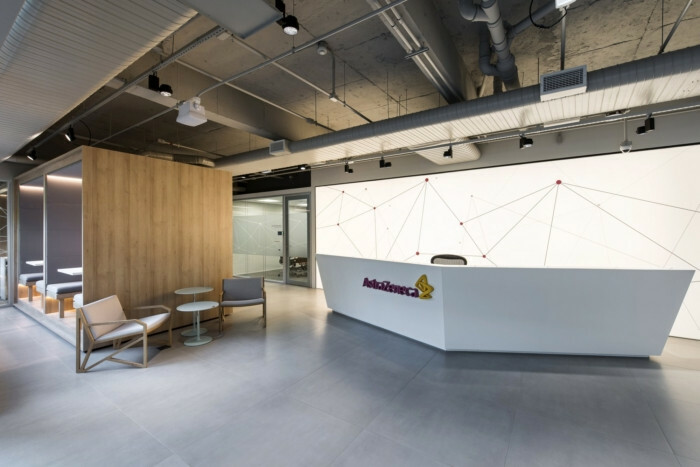 Pitá Arquitetura designed the new offices for AstraZeneca, a global pharmaceutical company located in Cotia, Brazil. This project was developed for AstraZeneca, a world-class pharmaceutical industry, in the city of Cotia, near São Paulo, in Brazil. The client required that the architecture must be focused on the well-being of the employees, attending many areas of the ways of work. For this, the concept of wellness has been applied all along the project, at the work areas, focus rooms, informal meetings, phone booths and even at the library. Challenges had to be overcome, as the building’s architecture is from the 70’s, all the infrastructure diverged from the big corporative constructions from São Paulo in that time, this way, all of the installations had to be upgraded to the standards used nowadays. Acoustic treatment and furnishing have been used to bring a whole new sensorial experience. Grandstand, conventional refectory tables, and casual furnishing creates a space that can be used from a simple coffee break or even a meeting with the whole team.